Never accept an invitation unless you’ve actually read it. My friend Sean Timberlake of PunkDomestics.com was hosting an event for Columbus Salame and sent me an email asking if I would like to attend. “Why not?” I thought. I had the afternoon free, it would be nice to see Sean, and I am rather fond of cured meats. It seemed like a win-win-win to me. “Cheer me on?” I wrote back. It seems I had missed the part where, by accepting, I had agreed to participate in a Top Chef-style sandwich making throw down with two other bloggers, Chef John of FoodWishes and Lynda Balslev of TasteFood in front of a panel of judges. 3 bloggers, 3 sandwiches, 20 minutes. With only one winner, the only likely outcome seemed more win-lose-lose than win-win-win. But, what the hell. I’d never entered a 20-minute sandwich competition before. I knew and liked my competitors personally, there would be food involved, and it would get me out of the house. Win, win, and win again. Before the competition began, the three of us were conveyed from the Hotel Vitale by pedicab to the San Francisco Ferry Building located directly across the street, which saved us precious time and energy and helped to ensure that none of the competition would meet a distracted, jay-walking traffic death (Thank you, Columbus). We were then each handed $10 (US) and given 10 minutes to explore the markets in search of a “secret ingredient”. John returned with a pluot and a handful of pine nuts, Lynda traded her money in for pinch of fennel pollen, and I wound up a fuji apple and bone marrow butter, which were the firs two things I came across with the correct price tag. Safely returned to the Hotel, John managed to tell our chauffeur that he and I were on our honeymoon in order to throw me off my game. I was about to admit to our driver that it was our second honeymoon, but I was too busy wondering what the hell I was going to do with four dollars worth of bone marrow butter to embellish his story. The three of us then placed ourselves at our designated work stations in front of the judges and got to work when the countdown had begun. 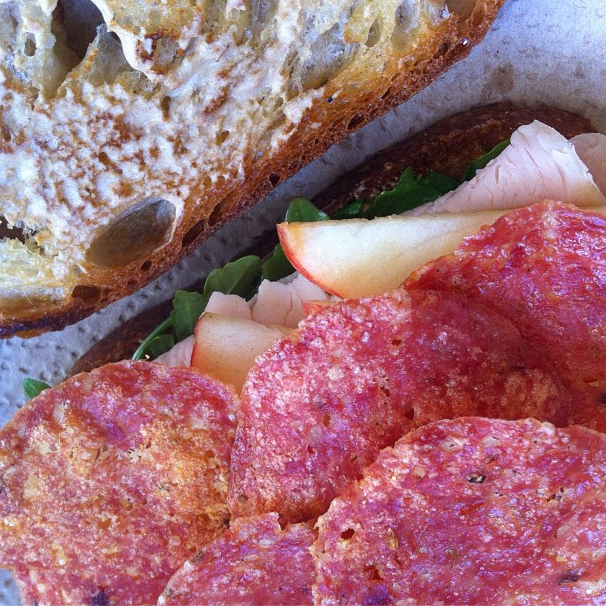 My sandwich was intended to be a simple one: smoked turkey, sopressata, apples, and arugula. My method of preparing the sandwich, however, was not so simple: fry the sopressata like bacon, smear the bread with an esoteric ingredient (bone marrow butter), build the sandwich, and toast the whole thing to a beautiful, toasty, crispy, golden hue. In 20 minutes. Of course, this did not happen. 1. If you are pressed for time, attempting to utilize an apparatus with which you are totally unfamiliar, like a panini press, is ill-advised. 2. 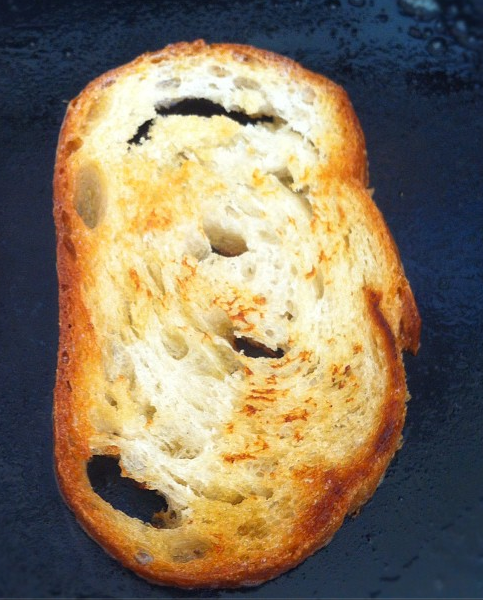 Obsessing over one element of a dish when there are others which need equal attention is not helpful. 3. Twenty minutes is not a very long time when it comes to creating an original sandwich off-the-cuff. 4. The fact that one can accomplish something in such a short span of time is extremely satisfying. But, damn it. If I’d had 10 more minutes, I would have nailed it. Honest. In my kitchen, this sandwich didn’t take 20 minutes. In fact, it only took 10. The beauty of it is the soppresata, crisped up like spicy discs of bacon. If you can get your hands on bone marrow butter*, get it. Stock up. It adds an incredible depth to anything it touches. So much so, in fact, that I am next considering applying it to my morning bowl of Malt-O-Meal. If you can’t find it, it doesn’t matter– the following recipe below doesn’t use it. Nor does it use a panini press, because said appliance and I are still not on speaking terms. 1. In a cast iron skillet, fry up your sopressata, flipping the pieces over from time to time until crispy. About 3 minutes. Shake off excess drippings into the pan and set the meat aside to drain and cool on a paper towel. 2. Add the butter to the pan. Put both slices of bread into the butter/sopressata fat, coating each side. Fry until both sides of the bread are crispy, golden brown, and sodden with delicious animal fat. Remove and place on the same paper towel your fried sopressata is resting. 3. Toss the arugula into what’s left of the fat in your skillet to coat, then remove. Briefly. The idea is not to fry the greens, but to gently wilt and flavor. 4. To assemble your sandwich, coat one side of each slice of bread with another thin layer of butter and a little mustard. 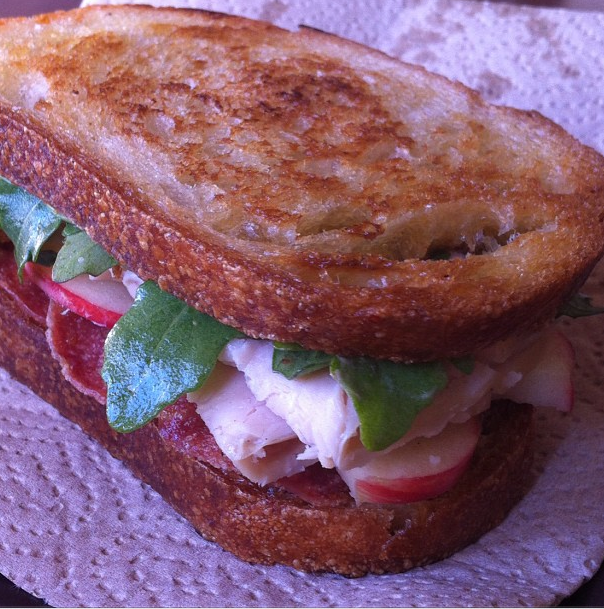 Layer the sliced turkey, apples, arugula, and crispy sopressata (this is the order I prefer, but you do it however you like) onto one slice of toast, then seal the deal with the final slice of toast on top. 5. Serve to a panel of judges, be they friends, lovers, colleagues, or parents. Or actual judges. They need to eat, too. * For SF readers, bone marrow butter (as well as marrow bones) can be purchased from the Prather Ranch store located in The Ferry Building. This entry was posted in Meatness, Sandwiches and tagged Columbus Salame, competition, reading comprehension, sandwich, soppresata. Bookmark the permalink. i gained 5 lbs just reading about marrow butter. where do you go to get this? the meat guy or the butter guy? I’m glad you brought that up, Carole, because you reminded me I should link to my source, which I just did at the bottom of the post. Prather Ranch Meat Co., which is located in the San Francisco Ferry Building. They have other Bay Area locations, too, and show up at local farmer’s markets. $4.00 for 4 generous discs of the stuff. If you can get your hands on some, do it. Ok, so if I do the math, then I came in 3rd? Alas, it was a slippery retro-’80’s slope I chose to tread… goodness knows what would’ve happened if I got my hands on a bottle of raspberry vinegar. Lynda– all retro-’80’s slopes are slippery. That is precisely what makes them so much fun. We all had lovely sandwiches, don’t you think? This sounds and looks just heavenly . . . . I may have to head in to Jack London Square and take the ferry across to the Farmer’s Market at the Ferry Building (my favorite way to get to the City, especially that part of the City) . . .
I’m sure there are other things that I can find to bring back with me other than just the marrow butter . . .
Did you take a cheering section with you? Did you practice at home before you went? I’ve never used a panini press either (usually use my cast iron griddle with a heated cast iron fry pan on top to weight it down. Doesn’t give the marks, but works and isn’t another piece of equipment I need to find room to store. No practice. No cheering section. I prefer to have as few people witness my shame as possible. Unless said shame involves a piano bar, a Rogers & Hart song, and several martinis. Sounds like we use the same non-panini press sandwich pressing method. Is there a vegetarian version of this Marrow Butter? Made from grinding the bones of free-range Soys perhaps? I have the feeling that the cows who supplied the bones were vegetarian. Is that at all helpful? So where did you buy the bone marrow butter? Please see the asterisked note at the end of the recipe for that information. Love your technique of wilting the arugula in the bone marrow fat. Sounds absolutely delicious! Thanks, Susan. It was delicious. Really and truly. I have the feeling I’ll be tossing more greens in warm fat this season. Michael ~ Irrespective of the Blue Ribbon loss, the concept behind your sandwich is inspiring. You made excellent use of the bone marrow butter by spreading it on the bread (good choice, by the way) and by wilting the rocket in it. I can see how the butter would showcase the pepperiness of the soppressata and the acidity of the apples. Delectable! Another thing I love about wilting the greens in the fat is that it means I don’t have to toss them in olive oil and season them separately. It saves time and keeps me from dirtying one more bowl, which is always a bonus. The larger bonus, of course, is that it just tastes really good. One should never become speechless over a sandwich. However, it is best to not speak when one’s mouth is full, so I am now confused. Perhaps one should become speechless over a sandwich. I must speak up in defense of the panini press, however. The secret is to preheat long and well. Then again, I don’t know how well the typical press works. I went all out when I bought mine; it is a commercial version with cast iron plates because I don’t care to ingest residue of Teflon with my sandwiches. I’d love to have a commercial panini press. However, the fact that I rid myself of a toaster to gain more counter space does not bode well for the purchase any bread-browning devices in the near future. The sandwich, however, is more than edible when crushed beneath the weight of a heavy cast iron skillet.